My first choice for a position I wanted to have in this organization was the blog editor. Yes, I know an executive position is more than enough but it wasn't what I asked for but I don't want to get to that now. That's for a future post. Anyway, I had a few plans for the blog section of the TomasinoWeb website. Simply put, I wanted a few bloggers to work with - five at the most. Since not everyone wants to type their emotions and thoughts in a word processor and would rather cover fun events, the blog section isn't really that sought out. Let's say the organization accepted five bloggers and five trainees. I wanted to find out what those five bloggers main interests are whether it'd be video games, TV shows, comic books, professional wrestling, dramas, and anything they're interested in. I would've told them to write articles on how the campus is a comic book, a drama or a TV show because it's light reading, not a thesis. It should be mildly amusing. We could have reviews of video games or comic book series that the students might enjoy. Basically, I wanted them to pick something they know a lot about and make them write about it in various ways, including how to make the common UST student to relate to it. As for the trainees, I wanted to copy the developmental system of WWE where wrestlers who aren't ready for the main roster can hone their skills. I want them to try and work on their blogging skills while giving them a few tips on how to improve. For that to happen, I wanted to try and have a different blog just for the blog section. A little odd but it would give these trainees to develop their writing skills and get feedback from people. I wanted to show that these trainees have skills that need to be a honed a little and they may not be TomasinoWeb website ready but I'll make sure they are. Yes, I finally thought of something convoluted to make the TomasinoWeb twitter account (located here) a little more interesting. As the Vice President of Online Operations (a really long title for a guy who controls a Facebook and a Twitter account of an organization), I was told to do something that would make our fanbase grow. 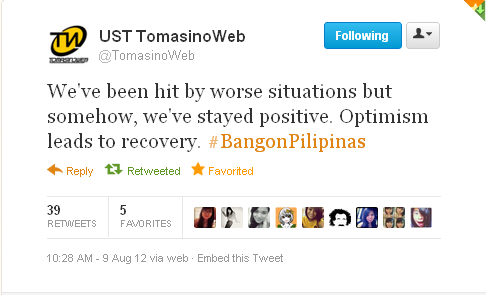 Usually, these "official" Twitter accounts of UST organizations are more formal and serious with their posts. So I thought "Why not go in a different direction?" If those other accounts are being serious with their tweets, I wanted to be funny. I wanted to give this Twitter account a human side instead of a formal "We are serious, we post news blah blah blah" feel to it. I want to connect with the followers in a way that would make them appreciate us. 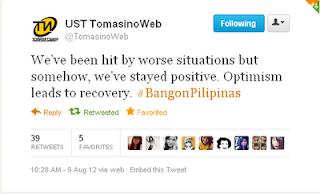 I want them to think that they can talk to TomasinoWeb informally, as a friend. The other organizations are being serious and just simply posting news. I want the 2000+ followers to read something on the lighter side. I want the followers to know that we try to bring you humor as well, something that everyone needs right now after that dire ordeal that was constant flooding and heavy rains. Now I'm not taking credit for anything at all. I just copied what ECW wrestler Tommy Dreamer said about competition. If your competition goes one way, you go another. Others are being serious, we go with humor. Once the others start being funny as well, we'll be serious.